This was FUN!! …..and chaotic!! 2 adults and 4 little ones in our small kitchen today to help Max with his Snax!!! His cousins came over to play and have lunch and we made nutella and pnb banana, strawberry tortillas then cut shapes out of them! The kids all helped cut out their shapes and ate most of them before we even got them on the plates!! I needed a reason to buy nutella-I never have-and this was it!! Yes, I had some on my Ezekiel toast this am….no, I don’t feel bad about it. Use fun shaped cutters to make shapes or use a pizza cutter and make triangles if you don’t have cutouts! 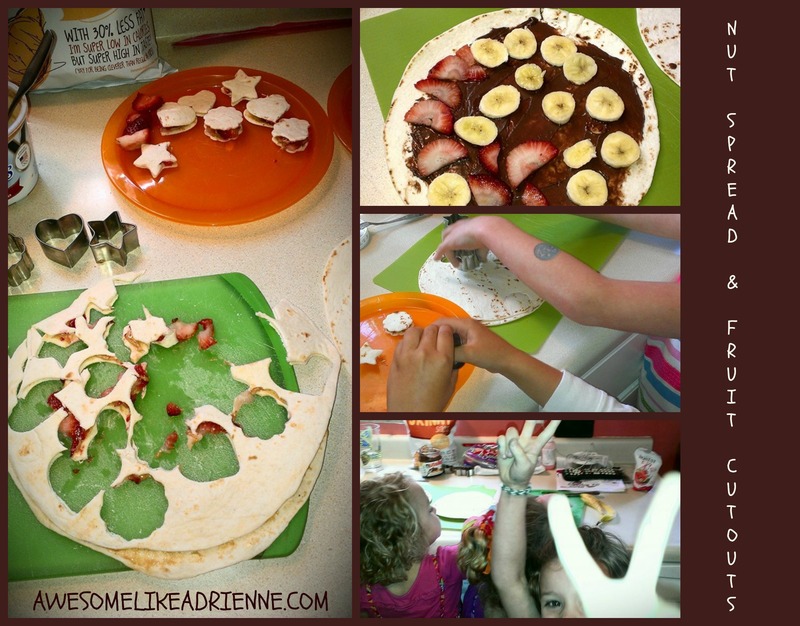 Posted on June 5, 2014 June 5, 2014 by awesomelikeadriennePosted in Snax with Max!Tagged almond butter, bananas, cooking with kids, cutouts, fruit, kids lunch, nutella, peanut butter, snacks, strawberries.